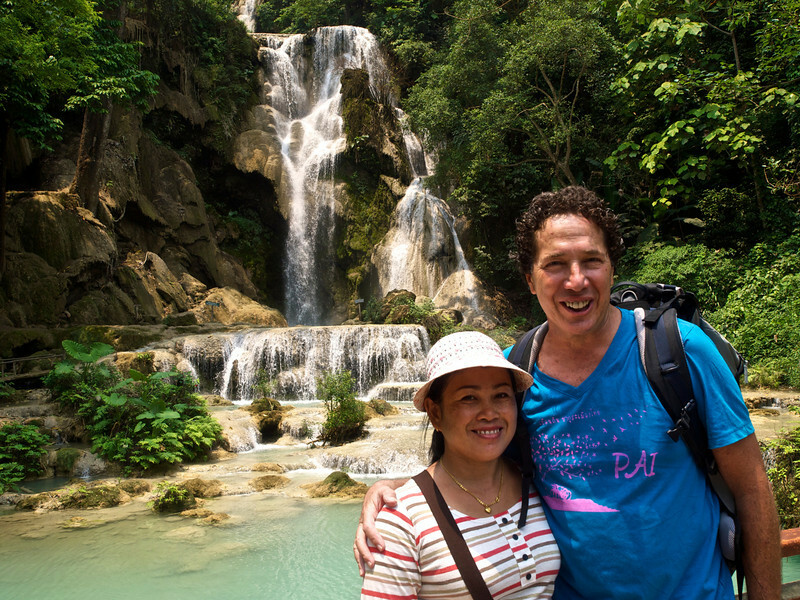 For our second full day (Tuesday) in Luang Prabang, we visited Kuang Xi Falls. 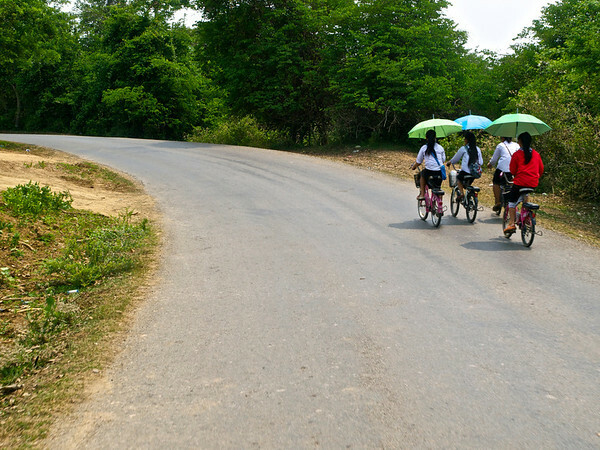 This is accomplished by a 30 minute yuk tuk ride (some do it on scooters and bicycles) through lovely green countryside steadily climbing the hills. 20,000 kip gets you into the park, about US$2.50. 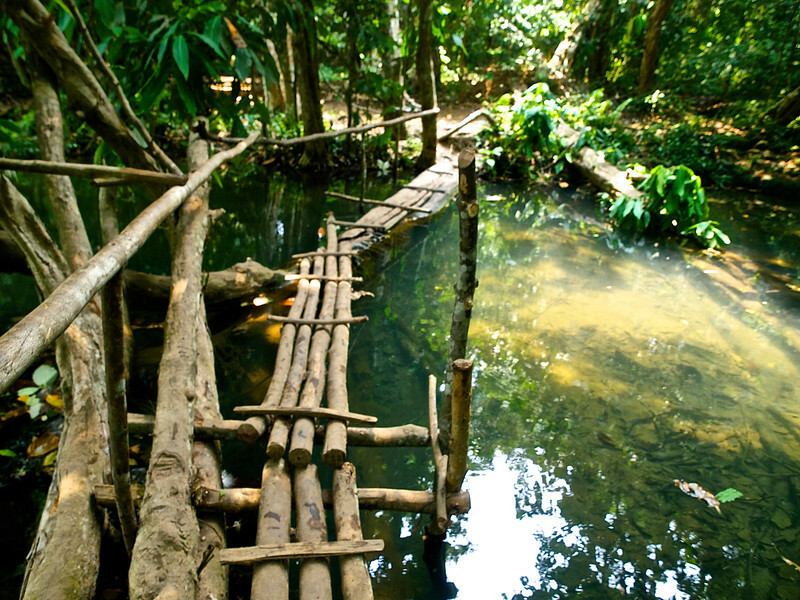 From there paths lead past a bear rescue facility where you can view Asiatic and Sun Bears that have been rescued from the illegal mountain trade. They reside in a series of very large enclosures and have jungle gyms, swings and other playthings. It isn’t the wild but it is better than having your liver harvested for bile. Many come there injured and malnourished. Here they are nourished and healed wherever possible. It may not be the wild but I think it beats the alternatives. From there we continued up and soon reached the first pools and waterfalls. It was already approaching 100°F with high humidity and I wasted no time in changing and diving into the frigid water. It was sooooo cold and felt sooooo good and I was soon swimming around happy as a clam. Then we hiked further up stopping at and passing many beautiful falls and pools along the way. Eventually the path ended at a very tall two-stage waterfall. Anna (who is not a hiker) surprised me by suggesting we climb to the top. 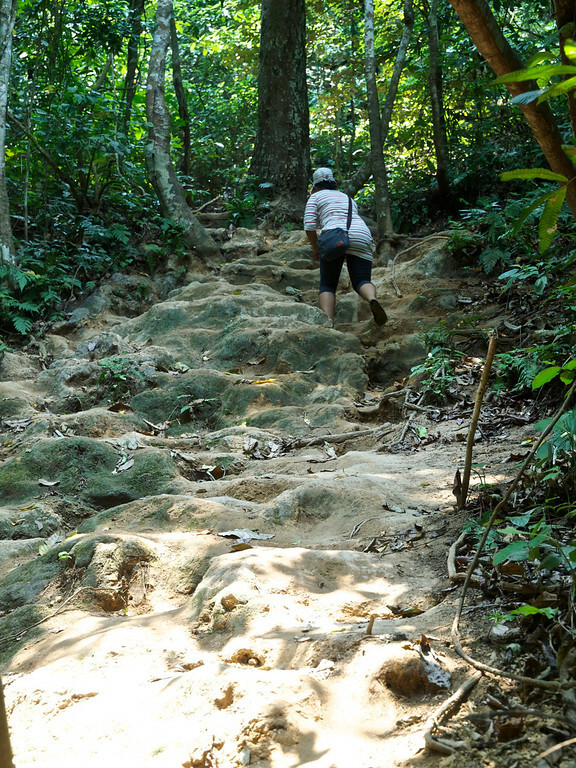 This was accomplished by a long very steep jungle path with occasional dirt steps cut into the mountainside. My little sweetheart smoked me on a couple sections and I have now added “mountain goat” to her many terms of endearment! 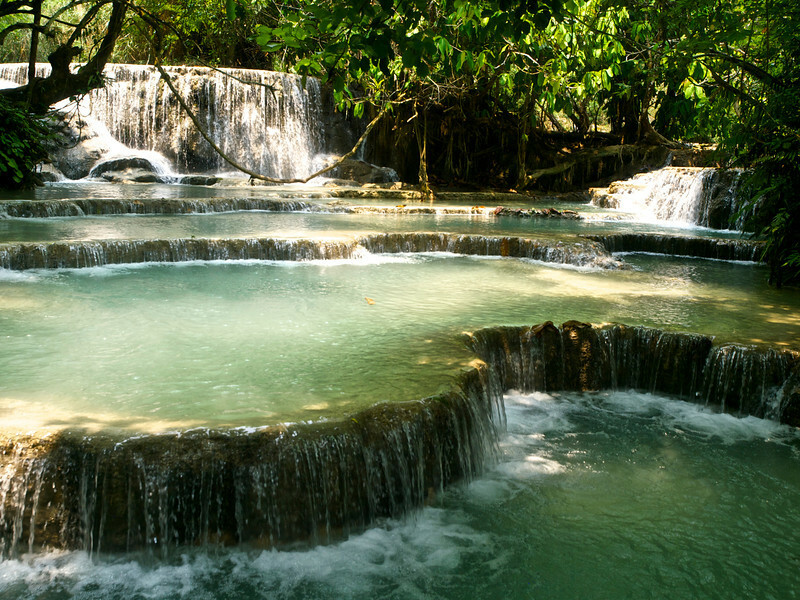 At the top is a series of heavily canopied pools leading to the edge of the falls. The pools are connected by bamboo plank walkways and the edge has a single bamboo pole at waist height with a sign reading “Danger” (ya think). It was a different semi-magical secluded environment and well worth the climb. By the time we descended back to the first pools I was drenched in perspiration and wasted to time in getting thoroughly soaked once again! 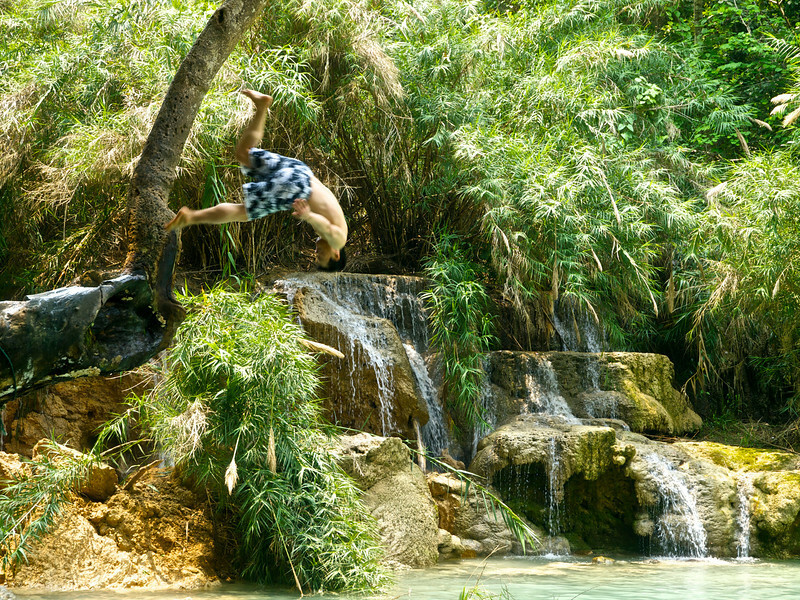 There is a rather slippery branch one can climb and jump or summersault into the water. Twenty years ago I would not have hesitated. This time, I weighed the risks, considered the non-state of medical care in Laos, considered how isolated we were, considered the difficulty of a medivac to Thailand and decided to leave it to the young kids. Hmmm, maybe I am growing up just a bit. The pools were more crowded now and I was glad we came early. We were up there a bit over three hours and our driver was waiting for our return to Luang Prabang. Once back, we had lunch at Joma Cafe, another great find. They do wonderful salads, sandwiches and coffee. Anna had a Greek Salad and homemade ice cream. I had a Reuben (which surprisingly was as good as L.A. or NYC) and an iced latte. Everything was spot on and the cafe is air conditioned which was welcome considering the temperature was about 108°F. That night we had dinner at the Coconut Garden. Peter had recommended this place but it was only ok. They messed up our order three different ways and after my fantastic find at Tam Nak Lao the night before, this was a bit disappointing. Well, it happens and maybe it was just an off evening. For Wednesday, out last day in Luang Prabang, we pretty much took it easy, returning to our room after breakfast, writing and napping the morning away. We walked a little in the afternoon but it was really hot so we kept it brief. Peter booked our two day Mekong boat trip for the following day and we had a nice dinner at Coconut Restaurant (different, cheaper, better). We will get picked up at 6:30 am tomorrow morning. We’ll leave my big backpack at Manichan until we return from wild northern Laos. Luang Prabang has so many great restaurants and mid range guest houses. Prices are a little higher than Thailand but for the quality of the Lao-French-Indochine cuisine, it is a bargain and well worth a little splurge for a few days. Manichan Guesthouse-private rooms with bath and a nice breakfast—$35/night reservations recommended. Tam Nak Lao–An epic five course dinner with beverage for two cost us about US$25. Jorma Cafe and Bakery-best bakery and coffee in LP—sandwich and beverage about US$8-10. Coconut Restaurant—Lao entrees about US$8. Beer Lao—US$1.50. Some wines available. 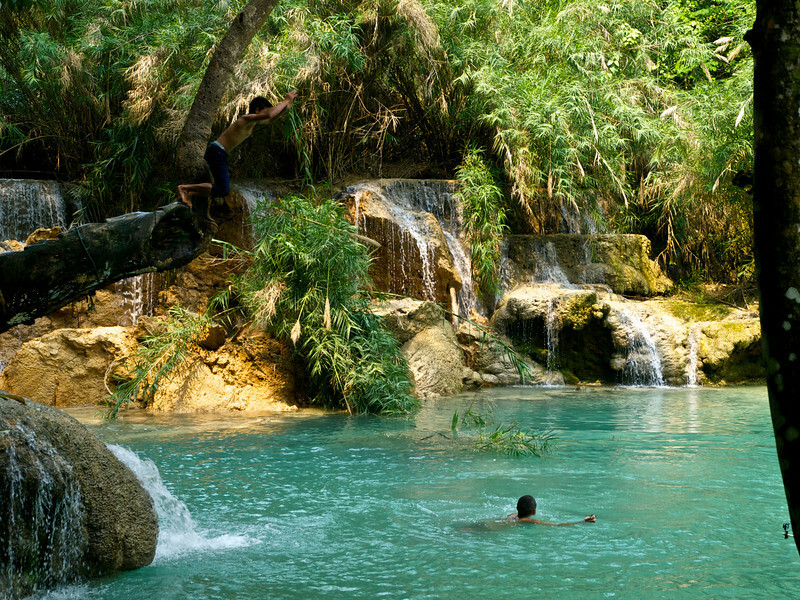 Kuang Xi Waterfall—just go. Tuk tuk—200,000 kip (about $25). Driver will wait for you (2-3 hours no problem). Try to leave by 10 am to avoid the crowds. Entry is 25,000 kip. Philip has been traveling the world since 2008. He travels slowly, often on less than US$ 30 per day, but occasionally, he likes to splurge on more luxurious digs. 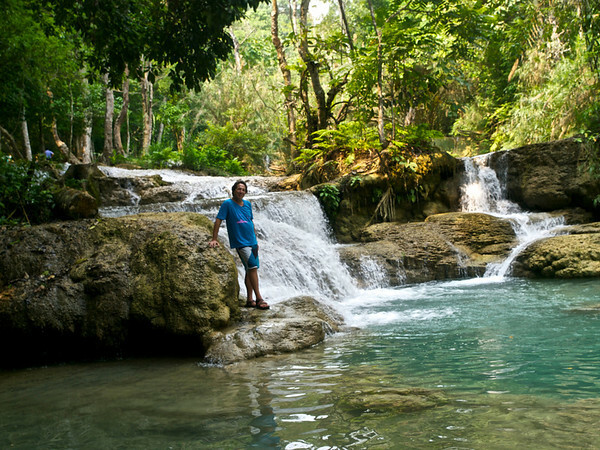 He started this blog in 2011 to share his adventures and travel advice. "My goal is to help people get over the unnecessary fear of long-term travel and experience the rich tapestry of foreign cultures." 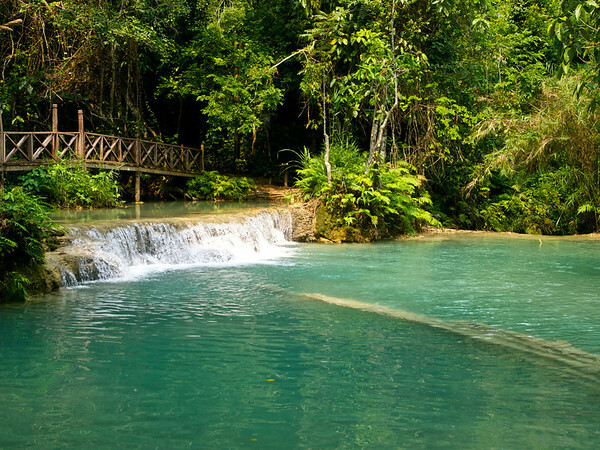 Those falls/ pools are luscious, total dream places – carry on.